Brantford – When teams from 27 countries compete in the Red Bull Escape Room World Championship this year, the mastermind behind the fiendish puzzle they’ll need to solve will be Scott Nicholson, professor and director of Game Design and Development at Laurier’s Brantford campus. On Sept. 22, during Laurier’s Brantford Homecoming celebrations, Nicholson invites the community to tour the Brantford Games Network Lab – also known as BGNLab – to see the space where creativity reigns as his students pursue their mission of designing games to change the world. It’s just one of the many innovative programs attracting students to Brantford. The Homecoming 2018 activities start Sept. 22 at 2 p.m. with a free barbecue for alumni and the community. Campus tours will follow, including visits to the BGNLab, CityStudio and Market Square. The tours will allow alumni and community members to explore Laurier’s unique urban campus. Laurier alumni will also have an opportunity to tour the new Laurier Brantford YMCA facility. Homecoming visitors will also have a chance to learn how Laurier’s campus-community connections go well beyond the buildings and infrastructure. At CityStudio, students work alongside municipal staff to tackle real-life issues, such as the problem of non-flushable materials ending up in our waterways. While CityStudio participants are changing Brantford for the better, Laurier’s User Experience Design students are aiming to do the same for the world by improving people’s experiences with a product, service, environment or message. The true showstopper for Homecoming 2018 may well be the long-anticipated Laurier Brantford YMCA, which opened its doors Sept. 14. Made possible thanks to the lobbying and support of Brantford Golden Hawks over several years, this game-changing facility is a major enhancement to sports, athletics and recreation at Laurier’s Brantford campus. The initiative also marks the first time that a YMCA has partnered with a post-secondary institution. An exclusive alumni-only reception will take place in the Hawk’s Nest – the student lounge at the new Laurier Brantford YMCA – Sept. 22 at 5:30 p.m. providing alumni with an opportunity to see this facility that will be enjoyed by Laurier students for generations to come. The celebrations in Brantford mark just the beginning of Laurier’s Homecoming. The university’s Waterloo campus will celebrate Homecoming the weekend of Sept. 28 to 30. 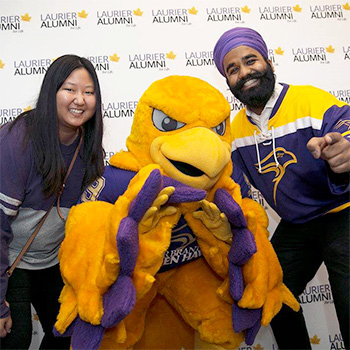 For registration and detailed information about Homecoming events, visit LaurierAlumni.ca/Homecoming.